Our website is changing. Kindly bear with us. Mr. A. H. Tobaccowala, Founder Chairman of Impact India Foundation passes away. 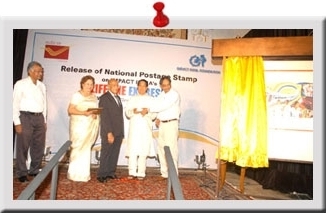 H. E. Shri S. C. Jamir, Governor of Maharashtra, released a National Postage Stamp at Raj Bhavan honouring Impact India's Lifeline Express - the world's first hospital train on May 12, 2009 in Mumbai - a project in partnership with the Indian Railways. He also launched Impact India's book, "Creating Rainbows" covering its innovative journey over 25 years. 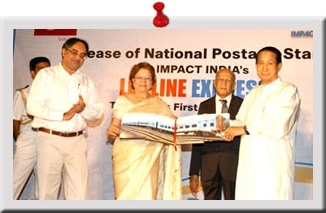 Speaking on the occasion, Shri S.C. Jamir, expressed his admiration of the achievements of the Lifeline Express and said that he was delighted that it was recognized by the Government of India through the Postage Stamp. The event co-ordinated by Shobiz was engaging and enjoyed by the audience as excerpts from "Creating Rainbows" were read out by Theatre and Film personalities Tara Sharma and Avantika Akerkar and interspersed with clips from the film on the Lifeline Express broadcast on BBC4. Gerry Troyna, the Director of the film was also present on the occasion. The Postage stamp is available at all post offices and the books are available at Impact India's office in Mumbai. Dashrath is going deaf, Bharat can't walk, baby Shiva was born with a cleft lip, But they cannot reach a hospital and can't afford the operations. This is the story of a train - a very special train called the LifeLine Express. The LifeLine Express has two state of the art operating theatres, recovery rooms offices and accommodation. And for each project a team of volunteer doctors, surgeons and nurses give their services for free. For four weeks cameras follow the Mandsor project, the train carries out operations on poor rural people whilst standing in a station in the middle of India. The operations change the lives of the patients and the doctors. Compelling, dynamic and moving stories, LifeLine Express leads us through a gateway into another India - where 21st century medicine meets village India. The new Lifeline Express with five custom-built coaches, bedecked like a resplendent bride, was on public display at the CST, main central station, Mumbai, on the 10th, 11th and 12th of April. Following a press conference, the media coverage contributed to a vast number of people visiting the "Magic Train" amazed by its state-of-the-art equipment and two operation theatres. After the three day exhibition and wonderful response, the train left for Atgaon, Shahapur, Maharashtra for the commencement of its 100th project,to mark Impact India's Silver Anniversary of service to the poor disabled of rural India. 2011 - 2016 © Copyright - Impact India Foundation. All rights reserved.